If you asked the fly, whose life I saved yesterday, about the spider whose legs I broke and crushed before drowning this morning, he wouldn’t believe you. You would tell him how I stepped into the shower and felt eight little legs break under my weight. How I lifted my foot and saw its crippled, semi crushed body stuck to the bottom of the bathtub. How I flinched a little when I washed him down the drain and then went about my regular morning routine. Just yesterday I left an inch of melted whipped cream and milkshake slurry in the bottom of a plastic cup on the counter while I went to the restroom. When I came back there was a large black fly struggling in the sticky puddle at the bottom. 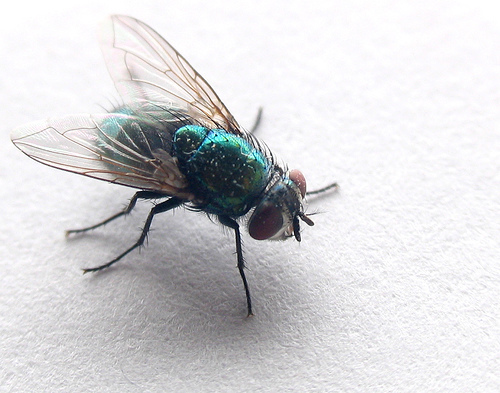 The same fly that buzzed around my head, while I was reading or typing, for what felt like the last several weeks. Weighed down by sugar and cream, he fell on his back and was not able to roll over. I watched him flail about on his back for a minute and thought of poking at him with my straw. But I felt bad for him. I positioned the straw so that he could grab a hold of it with his six little feet. At first he drew back towards the opposite side of the cup. He must have thought I was going to crush him. I put the straw next to him and turned the cup on its side. He wrapped his feet around the plastic and shambled up the straw. He paused at the top, unsure of leaving the cup and its bounty behind. I tore off a small piece of a paper towel, set it next to him and looked away. When I looked back he was frantically rubbing his appendages together and over his face, cleaning himself like a hamster. He was using the smallest corner of the paper towel. A man walked through the door so I picked up the cup and tapped the straw on the towel to shake him loose. He was not pleased, but I couldn’t very well have trash on the counter when customers come in. The fly hopped about on the glass while I greeted the customer and tried to slide the paper towel under it. It eventually got pissed off at me and buzzed a few feet away. I finished my conversation with the customer and checked the counter for the fly. In front of a plastic tub of edible body paint and bullet vibrators was the tattered half of a wing and sticky little speckles trailing off the counters’ edge. Posted in UncategorizedTagged creepy crawlies, empathy, flies, fly, guilt, interactions, Jeff Goldblum, milkshakes, not Jeff Goldblum, selective empathy, The FlyBookmark the permalink.